In just 48 hours, you can get a crash course in Tokyo’s unique culture. This 2-day itinerary allows you to explore the massive city’s many highlights, from touring ancient temples to seeing the city’s futuristic skyline at night. Here’s how to plan your days to make the most of your 48 hours in Tokyo. Morning: Tokyo is home to the Tsukiji Fish Market, one of the largest fish markets in the world, and you can take an early morning tour to catch all the action and even enjoy a cooking class or meal afterward. If fish isn’t your thing, visit a morning practice session of champion sumo wrestlers instead. Afternoon: Buddhism and Shintoism are essential to Japanese culture, and relevant temples and shrines can be found throughout the city. To make sightseeing manageable, choose a neighborhood walking tour and explore the religious sights within. Asakusa, Meiji Jingu, and Shiba Park are good places to start. Night: Learn more about Japan’s distinct cuisine from a local tour guide on a food or nightlife tour that revolves around a specific area's restaurants and bars. If you’re up for a night out on the town, join an organized pub crawl. Morning: Tokyo is full of excellent museums perfect for discovering Japanese history and culture. The Ghibli Museum is a must-visit for anyone with an interest in Japanese animation, while Ueno Park houses the Tokyo National Museum and the Ueno Zoo. Spend your morning taking in the highlights at the cultural sight of your choice. Night: After an active afternoon you may need a more restful evening. 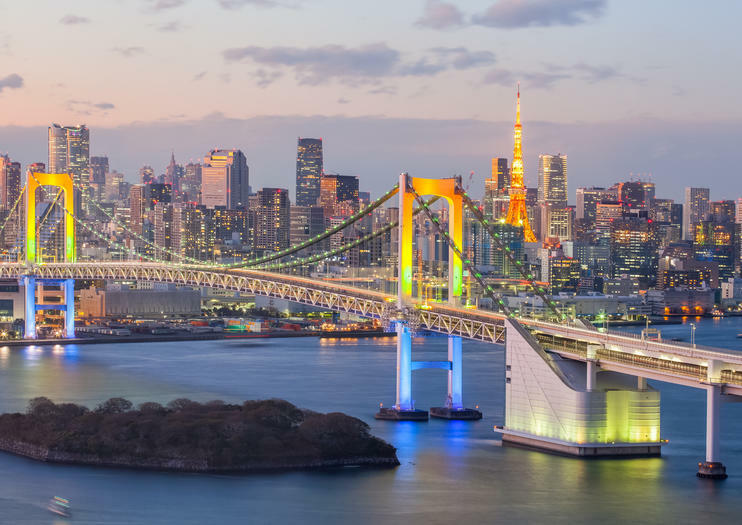 Hop on a Tokyo Bay cruise to enjoy nighttime views of the skyline, typically paired with onboard dinner and drinks. To keep the night going with more city views, head out for some after-dark exploration in the Odaiba area across the water from central Tokyo. Get an intimate look at Tokyo during this 6.5-hour bike tour. Discover the city’s hidden paths and top landmarks, cycling beneath the skyscrapers of Shinjuku to a local shrine and exploring neighborhoods like Ginza and Roppongi Hills. Pass landmarks like Meiji Jingu Shrine, Yoyogi Park, and the Imperial Palace before ending at the top of the 48-story Tokyo Metropolitan Government Building. A guide, bike, and helmet are included.